While pumpkin carving season is behind us, pumpkin baking season has only just begun! And we love baking with pumpkin… pies, cake, tarts, and muffins. The best pumpkin-baked goods are from scratch, using fresh pumpkin puree. Sound complicated? It’s not! 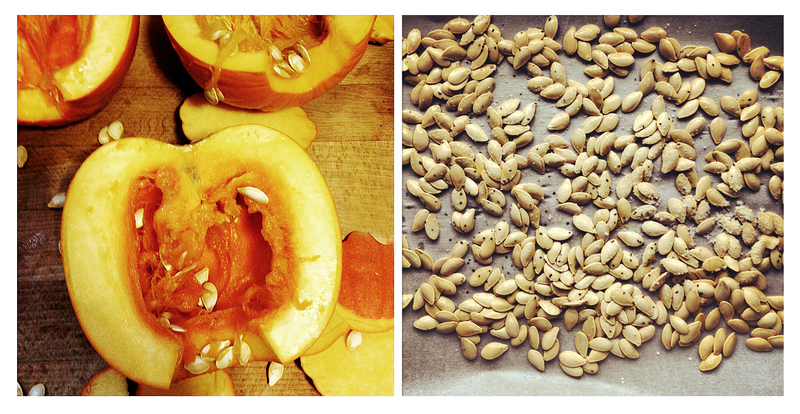 Plus when you use a fresh pumpkin, as a bonus you get the seeds too! And they make for a delicious (and healthy) little treat. Pumpkin Puree, let’s do it. 1. Pick the right pumpkin: you want a sugar pumpkin or “pie” pumpkin. You can get them at most grocery stores during the fall months. 3. Save the seeds! Wash and dry them, then toss in a bit of olive oil and salt then toast in a 300F preheated oven. 4. Cut your pumpkin in half, and then lay each side face down on baking sheet lined with parchment. Roast the pumpkin at 400F for about 45 to 55 minutes or until the flesh is tender and a table knife can easily be inserted. 5. Let cool, but while still warm, scoop of the flesh and puree with a blender or food processor. Discard the skin. Done. You now have fresh pumpkin puree. Let your pumpkin baking imagination run wild!